The expansive clays increase in their volume when they come in contact with water owing to surface properties of these clay types. The pressure which the expansive soil exerts , if it is not allowed to swell or the volume change of the soil is arrested , is known as Swelling Pressure of Soil. The swelling pressure is dependent upon several factors namely (a) the type and amount of clay in the soil and the nature of the clay mineral, (b) the initial water content and dry density, (c) the nature of pore fluid, (d) the stress history of the soil including the confining pressure and (e) drying and wetting cycles to which the soils have been subjected to. A soil with high swell pressure is considered “unsuitable” for use as embankment fill material and in case the sub-soil is having high swell pressure then suitable “ground improvement measures” may be needed before constructing embankment on such soil. One of the methods for constructing embankments on expansive soils is to lay a CNS (non-swelling clay) layer at the base of the embankment, to isolate the sub-soil from the moisture (mainly rain water) coming in vertically downwards direction. For any clay to be classified as “CNS (non-swelling clay)”, it should not have swell pressure more than the specified value (normally 0.5 kg/m2). 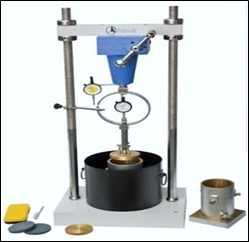 In laboratory, one dimensional swelling pressure test is conducted using either fixed or the floating rings on both undisturbed and re-moulded soils in the partially saturated condition. Two methods are employed, namely, “consolidometer method” in which the volume change of the soil is permitted and the corresponding pressure required to bring back the soil to its original volume is measured and “constant volume method” in which the volume change is prevented and the consequent pressure is measured. A device to hold the sample in a ring either fixed or floating with porous stones on each face of the sample. A consolidometer shall also provide means for submerging the sample, for applying a vertical load and for measuring the change in the thickness of the specimen. The provision for fixing of the dial gauge shall be rigid and in no case shall the dial gauge be fixed to a cantilevered arm. The dial gauges shall be fixed in such a way to record the vertical expansion of the specimen. (b) Specimen Thickness: Shall be at least 20mm in all cases. However, the thickness shall not be less than 10 times the maximum diameter of the grain in the soil specimen. The diameter to thickness ratio shall be a minimum of 3. (c) Ring: The ring shall be made of non-corrosive material. (d) Porous Stones: The stones shall be of silicon carbide or aluminium oxide and of medium grade. It shall have a high permeability compared to that of the soil being tested. The diameter of the top stone shall be 0.2 to 0.5mm less than the internal diameter of the ring. The arrangement for Swell Pressure Test by Constant Volume Method consists of Loading unit (5 tonnes), Proving ring (with high sensitivity, 200 kg capacity) along with all Apparatus as used in Consolidometer method. IS 2720(Part 41):1977 Methods of test for soils: Measurement of swelling pressure of soils. Reaffirmed- December 2016. Preparation of Specimen from Undisturbed Soil Samples: Clean and weigh the empty container. Cut-off the specimen either from undisturbed tube sample or from block sample, the latter generally being more representative of the field conditions. Remove about 30mm height of soil from one end of the soil sample. Gradually insert the consolidation ring in the sample by pressing with hands and carefully removing the material around the ring. The soil specimen so cut shall project as far as 10mm on either side of the ring. Then trim the specimen smooth and flush with the top and bottom of the ring. Wipe the container ring clear of any soil sticking to the outside and weigh again with the soil. The whole process should be quick to ensure minimum loss of moisture and if possible shall be carried out in the moisture room. The representative specimens from the soil trimming shall be taken in moisture content cans and their moisture content determined in accordance with IS:2720 (Part-XI). Preparation of Specimen from Disturbed Soil Sample: The soil sample shall be compacted to the desired (field) density and water content in a standard compaction proctor mould. Samples of suitable sizes are cut from it as given in Para (i) above. NOTE-1: Since swelling pressure of the soil is very much influenced by its initial water content and dry density, it shall be ensured that in the case of undisturbed soil samples, the specimen shall be collected from the field for test during the driest season of the year, so that the swelling pressure recorded shall be maximum. In case of remoulded soil samples, the initial water content shall be at the shrinkage limit or field water content, so that the swelling pressure recorded shall be maximum. NOTE-2: The desiccated soil obtained from the field coupled with smaller thickness of consolidation ring make the undisturbed soil specimen always in danger of being disturbed during trimming; hence great care shall be taken to handle the specimen delicately with the least pressure applied to the soil. Saturate the porous stones by boiling in distilled water for at least 15 minutes and moisten all surfaces of the consolidometer which are to be enclosed. Assemble the consolidometer with the soil specimen (in the ring) and porous stones at top and bottom of the specimen, providing a wet filter paper between the soil specimen and the porous stone. Then position the loading block centrally on the top porous stone. Mount this assembly on the loading frame such that load applied is transmitted to the soil specimen through the loading cap. In the case of the lever loading system, the apparatus shall be properly counter-balanced. 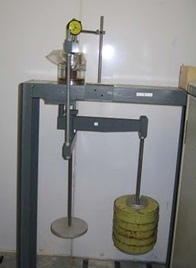 If a jack with load measurements by platform scales is used as the loading systems the tare weight with the empty consolidation apparatus, excluding those parts which will be on top of the soil specimen, which rest on the platform shall be determined before filling the ring with the soil and this tare weight shall be added to the computed scale loads required to give the desired pressures at the time of loading the soil specimen. Place initial setting load of 50 gf/cm2 (this includes weight of the porous stone and the loading pad) on the loading hanger and note initial reading of the dial gauge. Connect the system to a water reservoir with the level of water in the reservoir being at about the same level as the soil specimen and allow water to flow in the sample. Then allow the soil to swell. Record the free swell readings shown by the dial gauge under the seating load at different time intervals. The dial gauge readings shall be taken till equilibrium is reached. This is ensured by making a plot of swelling dial reading versus time in hours, which plot becomes asymptotic with abscissa (time scale). The equilibrium swelling is normally reached over a period of 6 to 7 days in general for all expansive soils. Then subject the swollen sample to consolidation under different pressures. Record the compression dial readings till the dial readings attain a steady state for each load applied over the specimen. The consolidation loads shall be applied till the specimen attains its original volume. Preparation of Specimen from Undisturbed Soil Samples as well as Preparation of Specimen from Disturbed Soil Sample: Same as for “Consolidometer Method”. Keep the consolidation specimen ring with the specimen between two porous stones saturated in boiling water providing a filter paper between the soil specimen and the porous stone. The loading block shall then be positioned centrally on the top of the porous stone. Then place this assembly on the platen of the loading unit. The load measuring proving ring tip attached to the load frame shall be placed in contact with the consolidation cell without any eccentricity. A direct strain measuring dial gauge shall be fitted to the cell. Inundate the specimen with distilled water and allow it to swell. Note down the initial reading of the proving ring. The swelling of the specimen with increasing volume shall be obtained in the strain measuring load gauge. To keep the specimen at constant volume, the platen shall be so adjusted that the dial gauge always show the original reading. This adjustment shall be done at every 1 mm of swell or earlier. The duration of test shall conform to the requirements given in “Consolidometer method”. Then dismantle the assembly and extract the soil specimen from the consolidation ring to determine final moisture content in accordance with IS: 2720 (Part-IX). The observed swelling dial reading recorded in Table 1 shall be plotted with elapsed time as abscissa and swelling dial reading as ordinates on natural scale. A smooth curve shall be drawn joining these points. If the curve so drawn becomes asymptotic with the abscissa, the swelling has reached its maximum and swelling phase shall be stopped, and the consolidation phase shall be started. The compression readings shall be tabulated as in Table 3 and a plot of change in thickness of expanded specimen as ordinates and consolidation pressure applied as abscissa in semi-logarithmic scale shall be made. The swelling pressure exerted by the soil specimen under zero swelling condition shall be obtained by interpolation and expressed in kN/m2 (kgf/cm2). The difference between the final and initial dial readings of the proving ring gives total load in terms of division which when multiplied by the calibration factor gives the total load. This when divided by the cross-sectional area of the soil specimen gives the swell pressure expressed in kN/m2 (kgf/cm2).